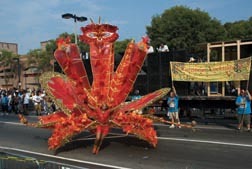 This Thursday, August 21, marks the opening of Boston’s Caribbean Carnival – a Trinidadian style extravaganza now in its 35th year. I attended this annual festival for the first time in 2003. Four years later I was offered a prime seat in the judges’ viewing station, where I shot this photo of Shirley Shillingford. She is a member of the Trinidad and Tobago Social Club, which is one of 9 area mas (masquerading) bands that compete each year. A succession of bands march their way down a 21-block parade route, ending up at Franklin Park. 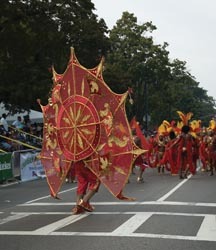 The King and Queen costumes are spectacular and they are followed by sections of exuberant dancing masqueraders. Be prepared for loud calypso music, the smell of jerk chicken, and vendors selling trinkets from Trinidad, Tobago, Jamaica, Barbados, and a number of other West Indies islands. Many in the Caribbean cultural community live for carnival. More than 600,00 people attend carnival, though most Bostonians have no idea this event takes place each year. Art critic Greg Cook previewed the event in the Boston Phoenix last week. It would be nice to have additional press coverage for a change.